I have come across a great resource, from an absolutely amazing magazine, Cloth Paper Scissors. Here is the link for their free eBook site. Here they offer free eBooks on art journalling, printmaking, collage, felting....the list is long. I will post pictures on what we were up to. Go forth and create your own masterpieces :) Happy creating everyone. 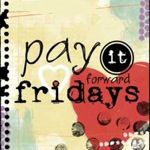 It is also Pay it Forward Friday. In that tradition, I give you these great resources. What are you going to do this weekend?